So much to take with you: carry-on, stroller, diaper bag, car seat, and your child! We recommend a new product that allows you to carry it all with one hand, the TOTEaTOT. 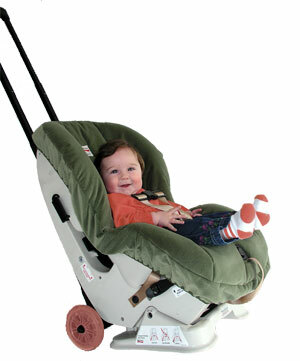 TOTEaTOT easily and securely attaches your carry-on rolling suitcase to your child’s own car seat creating an in-airport stroller! You will be the envy of even childless travelers when you effortlessly take it all--the luggage, the car seat, the diaper bag, and your child--with one hand! On the airplane, your child is safer, not to mention better behaved, in her own car seat. And no costly car seat rentals at your destination, you’ve brought your own! TOTEaTOT is an affordable necessity for safer, easier travel. $24.95 at www.toteatot.com. I LOVE THIS GREAT IDEA,I WOULD LIKE TO KNOW THE PRICE ON IT.THIS IS WOUNDERFUL BY ME BEING PREGANT A YEAR LATER AFTER MY 11 MONTH OLD SON ITS HARD TO CARRY HIM AND GET A STROLLER TO. I WOULD LIKE TO KNOW MORE ABOUT THIS PRODUCT. I have used this product and it's wonderful! We also sell and rent them and have received only positive feedback from our customers. They sell for $99 Canadian plus shipping. 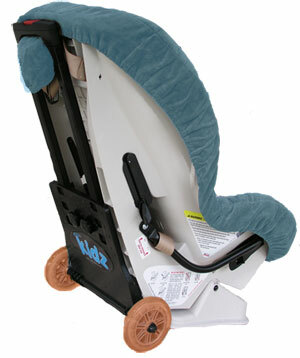 The CARES child restraint, by Kids Fly Safe, is also worth checking out. It's a seat belt designed for 22-44 pound children and attaches to the regular airplane belt. Airplane seat belts are designed for adults and now there is a safe way to fly with your children where you do not need to bring the car seat. They retail for $85 Canadian. They are only for airplanes though. You cannot use them in a car. Do you have any good tips for airport travel? It's great that we can get the personal loans moreover, this opens completely new opportunities.